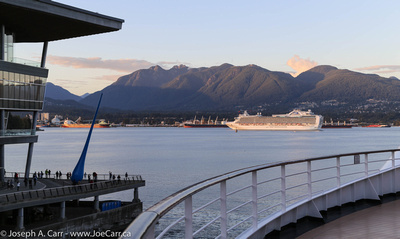 This cruise departed from Vancouver and returned to the same port 17 days later. Both the first leg from Vancouver to Hawaii and the last leg returning to Vancouver involved six days at sea. It was great to revisit the Hawaiian Islands again – there is always so much to see and experience, and the weather both on sea and land was perfect. If you just want to see photo albums, the 2017 Hawaii Cruise collection of photos covers everything I encountered during this voyage both onboard and ashore. My 65th birthday was looming, and I was determined to run away from home to celebrate! I had cruised to Hawaii in 2010 on my way to New Zealand, and again in 2014 has part of a South Pacific cruise to Polynesia. 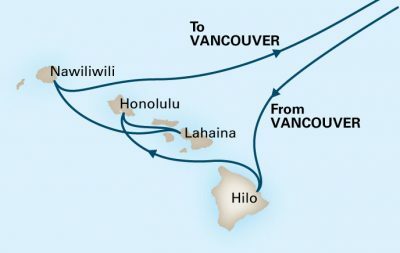 I had fond memories of both cruises, so it wasn’t hard to decide to repeat the shorter segment just to Hawai’i once I discovered the Eurodam was sailing from Vancouver and returning to the same port. I live a couple of hour’s travel time from Vancouver, so this made connecting with the ship very easy. The icing on the (birthday) cake was finding two friends to travel with who just happened to be celebrating birthdays as well, and who wanted to get away. So we decided to eat and drink our way to and from Hawai’i, and not worry too much about accomplishing much else…it would simply be a get-away. My friends and I booked basic ocean-view staterooms directly with Holland America, since as repeat customers they offered to pay for the normal hotel service charge (gratuities) paid to staff. This greatly reduced our hotel bills due at the end of the cruise! I only booked one shore excursion through Holland America for some snorkelling in Kaua’i, however that ended up not working out due to heavy onshore waves causing a a cancellation by the tour operator. I also booked a special dinner for my friends and I in the Pinnacle Grill for my birthday – the cruise lines’ Executive Chef’s Rudi’s Sel de Mer special seafood offering. Holland America sent a couple of cabin upgrade offers, and the last one was just too good to pass up – upgrading to a verandah cabin, which I had never experienced before. My friends also upgraded under the same offer. We ended up enjoying having a verandah to ourselves so much! This particular cruise was not as reasonably priced as my previous cruises with Holland America. The fare for a basic ocean view cabin had increased by about $50/day and the cabin upgrade I selected added another $50/day. That said, I enjoyed this cruise immensely, partly because of the upgrade. I also saved money by not having to fly to the port of departure, and the pre-paid hotel service charge (gratuity to on-board staff) included by Holland America was a very welcome reduction in overall expense as well. We arranged to meet a friend in Hilo who lives on the Big Island, and spent the day with her. Since the ship stayed overnight in Honolulu, we could enjoy meals and amenities aboard the ship at no cost, and we could take our time to explore Honolulu. This was another wonderful cruise on Holland America. The cruise line continues to provide the personal touches for its passengers, despite the cutbacks in service being implemented across the cruise ship industry. I was spoiled while aboard the Eurodam. The highlights of the trip for me have to be the wonderful meals aboard the ship and the good company of my friends. Sailing in and out of Vancouver Harbour was spectacular!